"The annual produce of the land and labour of England is certainly much greater than it was, a century ago. 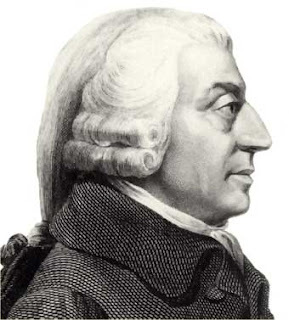 Few people doubt this, yet during this period, five years have seldom passed in which some book or pamphlet has not been published pretending to demonstrate that the wealth of the nation was fast declining, that the country was depopulated, agriculture neglected, manufactures decaying, and trade undone. Nor have these publications been all political party pamphlets. Many of them have been written by very candid and very intelligent people, who wrote nothing but what they believed, and for no other reason but because they believed it." Is the subject article designed to confuse the issue of whether the rich are getting richer and the poor are getting poorer? Having legal possession of a big screen TV, manufactured in China and acquired at the local big box, through clerks earning a little more than minimum wage, on a no payments or interest until next year plan is not wealth. ..when i'm getting a 60" HD plasma for the price i could get a 27" tube 5 years ago, i'd call that an increase in quality of life. Maybe that works for you if your quality of life is determined by TVs instead of health care costs, fuel costs, and foods costs. A lot of people determine quality of life quite differently. Although these are good times in a lot of ways, many people still have huge problems just making ends meet. Compared to my ancestors, I gladly pay more for fuel, food, and health care. I travel a lot more than they did. I eat better and in a more convenient way. And I live longer as a result of our current health care. So, yes, that is what I'd call a stellar increase in quality of life. Even the "poor" here have it better than the average citizen of Greece for example. Yet, we still complain... It's human nature. There’s a huge difference between complaining and being complacent. When we quit wanting to make things better, we can easily lose what got us there in the first place. Winners, not whiners, always keep trying to improve and exceed their goals. If that sounds like complaining to some, well, that's OK.